Republican politician from New York State and Town Supervisor of Rye in Westchester County, Joseph Carvin, was one of the key speakers. If the rest of the Republican party could be as forthcoming as he is on climate change threats the US Congress could move ahead aggressively in combating climate change as one can see in reading Joe’s speech (Carvin transcript REV 1 ) or watching him in youtube (see https://www.youtube.com/watch?v=rRFqooitiJE). 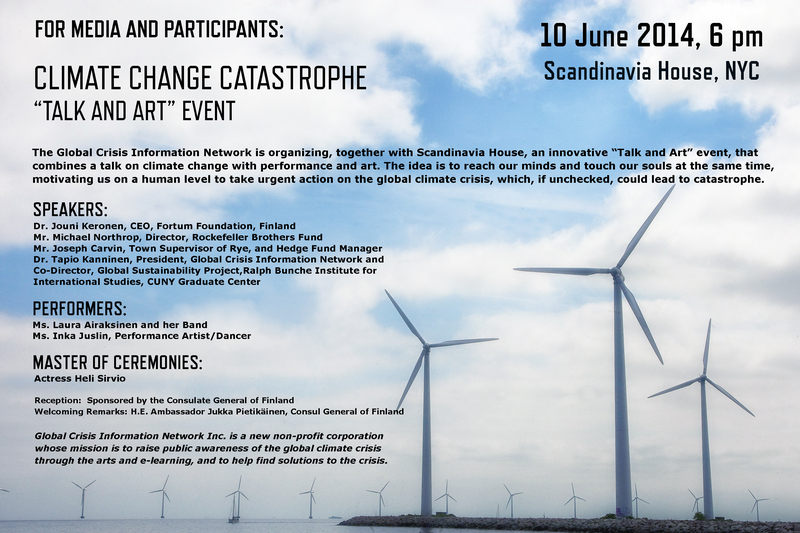 Other speakers were Dr Jouni Keronen (see Keronen – NYC-10-6-2014-pdf), a new CEO of the Climate Leadership Council established in Finland in May 2014 promoting climate sustainability action by the biggest corporations in Finland and Michael Northrop, Director of Sustainability Program at Rockecfeller Brothers Fund. Michael’s speech followed quite a lot the following article he has published recently: http://www.huffingtonpost.com/michael-northrop/reasons-for-optimism-on-c_b_4545836.html. Tapio Kanninen also spoke ( see Tapio Kanninen – Art and Talk Event Scandinavia House REV 1 June 10 – 2014) or youtube here: https://www.youtube.com/watch?v=D-sjYTUPceM.